Large-scale land use change has become a common practice leading to massive depletion of forest wealth in the catchment of the Narmada and its tributaries in Madhya Pradesh. The forests that stretch across the undulating slopes and ridges of the Vindhya and Satpura mountain ranges that provide the passage to the Narmada river and its tributaries to flow have continued to face immense biotic pressure due to a horde of factors including illegal logging, massive encroachment, reckless collection of minor forest produce and firewood collection, unhindered grazing on forest land and forest fires. What is compounding the situation is political patronage to timber and mining mafia and especially those engaged in large-scale sand mining from the river bed. The implementation of the Forest Rights Act is another problem area that requires in depth investigation. Under the prevailing scenario, there is widespread ground water level fluctuation and this is reason enough to raise the alarm bells. The riparian buffer zone and floodplain areas of the Narmada River are dominated by reckless agricultural practices on both banks. Modern agricultural practices that rely heavily on chemical fertilisers and pesticides are leaving an adverse impact on soil quality. The situation is getting aggravated due to soil erosion, salinization, desertification, compaction, and pollution. The agricultural practices are also leaving an adverse impact on the water resources across the Narmada Valley, which is a massive watershed stretching through the central Indian highlands. This area, which is the heart of India, could be treated as the water capital of India since the Narmada and its tributaries charge the major river systems of the Gangetic plain and also the northern part of the Southern plateux, drained by the Godavari River and its tributaries. The river system, water bodies and underground water in this region is continuously getting polluted by nutrients and pesticide leaching. When the Narmada valley and its river system is under severe threat due to immense biotic pressure, the Madhya Pradesh Government suddenly woke up and launched the “Narmada Seva Yatra” in December 2016 – two years ahead of the general election to the State Assembly. When he was launching this Yatra, Madhya Pradesh Chief Minister Shivraj Singh Chouhan had declared that compensation shall be paid to the farmers owning agriculture land on the banks of the Narmada river for plantation of fruit bearing trees till they mature. When the State government was moving rudderless and talking of planting fruit bearing trees without a scientific blue-print to achieve the desried results, a silent green revolution was already taking place at Khalghat along the Narmada in Khargone district in Western Madhya Pradesh. Patanjali Jha is a 1986 batch Indian Revenue Service Officer and alumnus of Delhi School of Economics. His job is to deal with the whole gamut of Income Tax related matters and ensure the tax payers stay on the path of rectitude. In the fast paced world where most officers only think of climbing the ladders of success and vie for prized postings, Patanjali thinks out of the box. 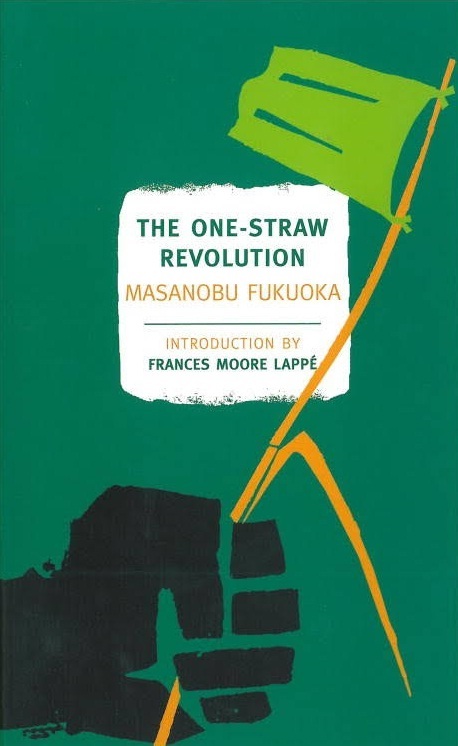 The spark that ignited Patanjali’s imagination came from “One Straw Revolution” authored by Masanobu Fukuoka. The book that he read more than 15 years ago, taught him the importance of sustainable growth. He has also been inspired by Peter Wohllen, author of “The Hidden Life of Trees” and American Geologist David R. Montgomery and his monumental work “Dirt -The erosion of Civilizations”. Patanjali has adopted the pathbreaking practice of vertical farming on a piece of land at Khalghat. At Vanya, his farm, Patanjali follows the innovative alternative no-tillage based agriculture practice. His model is multi- layered, multi-species farming system charatcterised by tree crops, including Moringa, mango, tamarind, amla, papaya, banana. ber(Indian jujube), guava, Indian gooseberry and a variety of flowering plants like pink pepper that flowers twice in a year and this ensures bees have food for the entire year. Vanya has become a showcase for no-tillage farming without pesticides and chemical fertilisers. 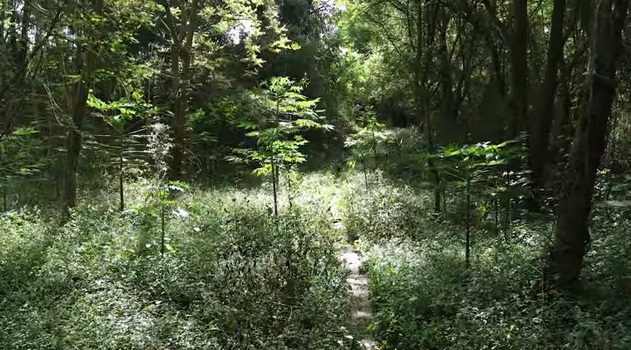 Patanjali is infinitely excited about the concept of growing food in forest like conditions. He has moulded his concept of farming on Bill Mollisons permaculture. Patanjali talks of the Sun, which provides more energy than we need, vast stretches of arable land, the monsoon and the large size of the population in India that draws sustenance from agriculture, to convey the need for natural farming. He describes it as the best method to maintain the natural cycle, conserve nature and protect the future of humankind. At Vanya, which has multi-layered canopy of trees and plants, there are Neem trees girdling the boundary. On this tree are planted a wine of Guduchi (Tinosporacordifolia). It is a rich and valuable herb that builds the immune system against serious ailments like malaria, dengue, and swine flu. On his farm there are plenty of Moringa (Drumstick tree) trees. These are tall trees with small leaves that allow sunlight to fall on the next layer of citrus trees of kafir lime, sweet lime and Gondoraj lime. Near the floor is the third layer of cowpeas and vetiver grass. The bottom layer also has aloe vera and turmeric, which needs very little sunlight. Vetiver, a special kind of bunchgrass native to India, is what he uses freely on his farm to arrest water and moisture. 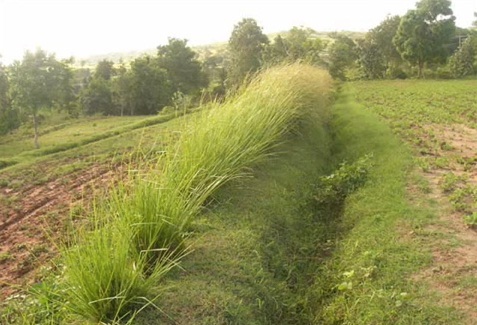 Vetiver also helps immensely in arresting soil erosion. This grass, which has a long life span, transfers micro nutrients deep below from the soil to other plants through their roots. He goes to cite research findings to convey that plants surrounded by vetiver grow much faster than plants without vetiver in close proximity. Patanjali wants to spread the message about the immense benefits of vertical farming far and wide. He has the results to demonstrate how his alternative agriculture practice, if adopted on a large scale could help significantly in terms of Carbon sequestration, thereby contributing towards the mitigation of global warming and climate change. 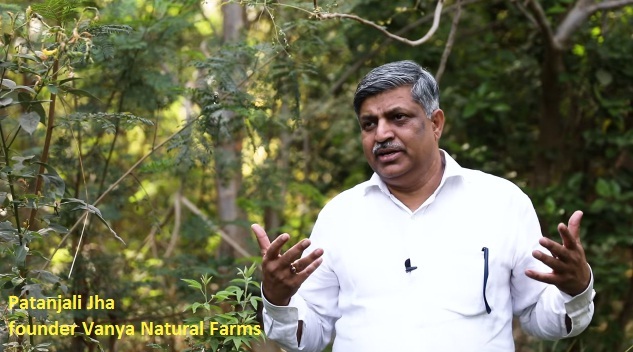 Patanjali has adopted a sustainable practice that relies heavily on the natural regeneration process. The agriculture productivity in this setting rises anywhere between 100 to 300 per cent, he points out. 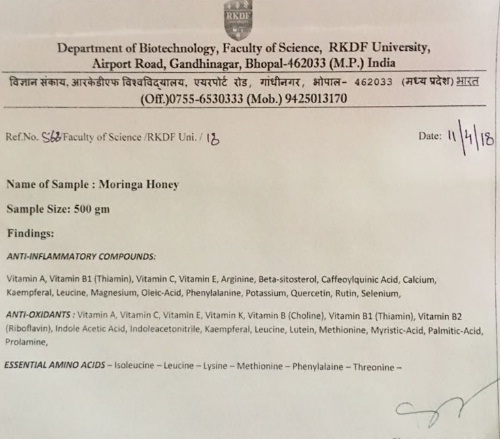 Test report of Moringa Honey from Purnia, Bihar. It is claimed that this honey is better than Manuka honey from New Zealand – the most expensive honey on Earth. The bee hives at Vanya produce natural neem honey. So many cancer patients come to Vanya where they get free honey and turmeric considered good for immune therapy. Patanjali told Newsroom24x7 that on demand he could send honey and turmeric grown on his farm to cancer patients across the world free of cost. They would oly have to pay the courier charge, he adds.